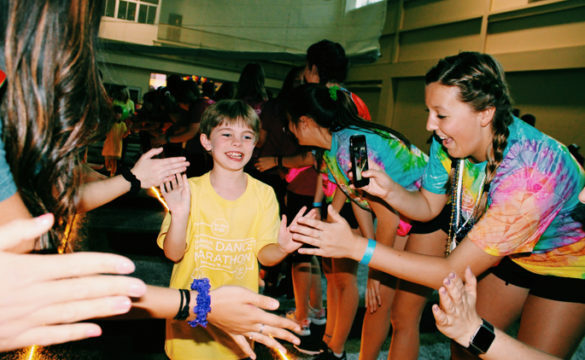 Dance Marathon, Vanderbilt’s largest student-led philanthropic organization, raised a record $282,332 to benefit Monroe Carell Jr. Children’s Hospital at Vanderbilt during its recent annual event. Including this year’s total, Dance Marathon has exceeded $2 million in cumulative giving for Children’s Hospital. Shown here, VU student Kendall Phillips gives a high-five to Hank Glasscock, child ambassador for Children’s Hospital.